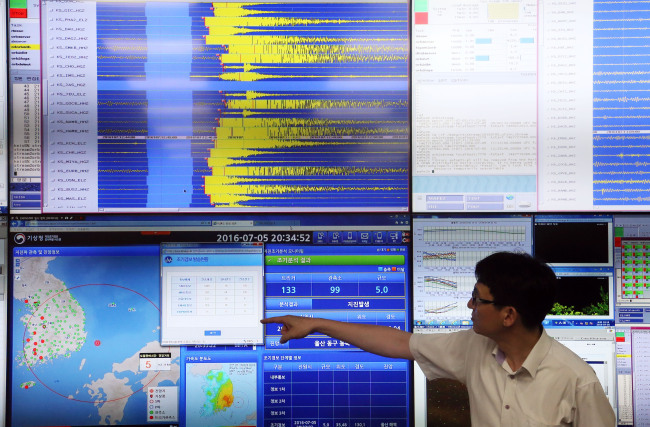 At 8:33 p.m. on Tuesday, the shock wave was detected 52 kilometers east of Ulsan, according to the Busan Regional Office of Meteorology. At 9:24 p.m., a magnitude-2.6 aftershock was detected in nearby cities, including Busan and Daegu, according to the state weather agency. The Ministry of Public Safety and Security said there had been no reports of casualties or damages from the shock waves as of Wednesday afternoon. The Ulsan Fire Department said Wednesday it has fully mobilized its workforce overnight and are continuing to watch out for reports of casualties or property damages. “I felt the ground vibrating while I was sitting in a restaurant. The building was shaky as if we were inside a makeshift building,” said Kim Hyung-zip, a 39-year-old office worker in Seoul, who was visiting Ulsan at the time. “But most of the people in the building stayed nonchalant without bothering to evacuate. It made me think whether we are a little bit ignorant about safety when it comes to earthquakes,” he added. The scale of earthquakes goes from a magnitude of 1 to 10, with higher numbers being the strongest and accompanied by ground vibrations, tidal waves and storms. “We have been recently detecting frequent occurrences of small-scale earthquakes, although the peninsula is located at the fault zone, which normally leads to brittle shock waves,” said an official from KMA. Experts warned that without ample preparations and disaster prevention measures, there could be a greater risk of damages when tremors of a magnitude of 7 or higher occur. “When strong shock waves are detected in nearby countries such as Japan, it may add on to shock waves felt by the Korean Peninsula,” Hong tae-kyung a professor of earth system science at Yonsei University told The Korea Herald. “Earthquakes of magnitude over 7.0 can create more secondary shocks in neighboring areas, which last from five to a maximum eight years,” he added. Lack of earthquake-proof facilities and measures across the nation is also problematic. According to Ministry of Land, Infrastructure and Transport data, in 2015, just 26.7 percent of three-story or over-13-meter-high buildings in Seoul were built based on earthquake-proof designs. The total figure across the country was slightly above 34 percent. The current enforcement decree of the Building Act, which took effect in 1988, states that buildings over 13 meters high with a total floor area of 500 square meters must be built with earthquake-proof designs. Meanwhile, the Ministry of Public Safety and Security came under fire for causing confusion among the public when issuing a warning for Tuesday’s earthquake near Ulsan. The ministry was criticized after it sent disaster warnings via text message to residents in just eight districts in Ulsan city and counties in South Gyeongsang Province. The date of the earthquake occurrence was also mistyped. Those without LTE smartphones or using phones released before 2013 could not receive the ministry’s warnings. The ministry later explained it had followed due regulations in sending the warnings to residents in areas with over magnitude-4.0 earthquakes. Meanwhile, the Hanbit nuclear power plant -- the only power station located on the western coast in South Jeolla Province -- was reported to have detected shock waves Tuesday evening, according to Korea Hydro and Nuclear Power Co.
Tuesday’s earthquake was 325 kilometers away from the Habit nuclear power plant. The KHNP said that the 0.0004g seismic value -- “g” is used to express peak ground acceleration -- detected was far below the plant’s level of constructed earthquake-proof value at 0.2g. Korean nuclear power plants are required to be built with earthquake-proof designs so that they will automatically stop operating when a seismic value is detected over 0.18g. The KHNP added that the plant’s No. 2 unit had been suspended for a “planned accident-prevention checkup.” Its other five units were still in operation as of Wednesday afternoon.